Start speaking Finnish in minutes, and grasp the language, culture, and customs in just minutes more with Absolute Beginner Finnish, a completely new way to learn Finnish with ease! Had some experience in Finnish? Up the challenge with Beginner! Welcome to Beginner Finnish, Volume 1 You're on your way to Finland! Master the basics of Finnish conversation! 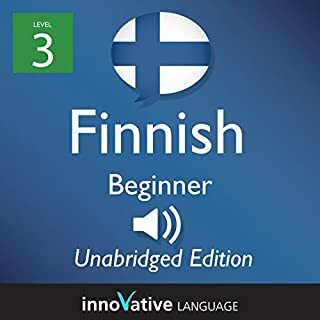 Start speaking Finnish in minutes, and learn key vocabulary, phrases, and grammar in just minutes more with Beginner Finnish. Our native Finnish hosts break down all the sentences, grammar, and more in a simple, easily understandable way! The course consists of lessons centered on an audio blog that is completely in Finnish. These audio blogs take you around Finland and introduce you to many different aspects of this country, including culture, history, folklore, arts, and more. These blogs will also teach you all about many different cities, and what they are famous for. 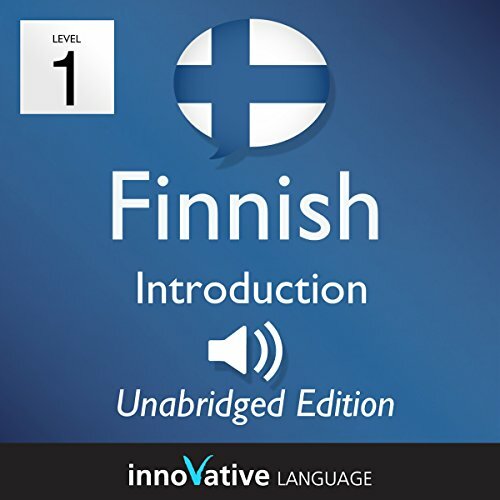 Along the way, you'll pick up sophisticated expressions and advanced grammar in this Audio Blog series presented entirely in Finnish. Ready to speak and understand Finnish at an Intermediate level? Close your eyes and picture yourself arriving at an airport, walking out and finding yourself on a busy street. Imagine hearing the native conversations all around you.This is the kind of Finnish you learn here. Practical, everyday conversation. This audiobook is great for Intermediates ready to go past basic phrases like "How are you?" In fact, you start speaking in minutes. 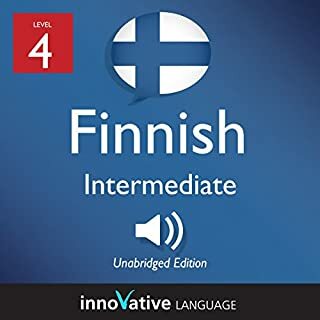 This audiobook is a completely new way to learn Finnish vocabulary fast! 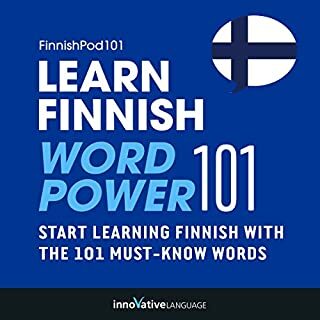 Start speaking Finnish in minutes with the powerful learning methods you will master in this book. The vocabulary words you'll find in Learn Finnish - Word Power 101 were hand selected by our Finnish language teachers as the top 101 most frequently used words in the Finnish language. Hear the word to master the pronunciation. Do you want to learn Finnish the fast, fun and easy way? And do you want to travel to Finland and get around like a pro? Then this is the audiobook for you. Learn Finnish: A Complete Phrase Compilation for Traveling to Finland is designed for absolute beginner learners and travelers. You learn the must-know travel phrases, survival phrases, vocab, and cultural insights to make your trip to Finland a breeze. All were hand-picked by our team of Finnish teachers and experts. Going to Finland and looking to make friends? Don't leave home without the Top 25 Finnish Questions You Need to Know! In this powerful audiobook, you'll master responses to all the basic questions, from "What's your name?" to "Where are you from?" and more. Built into every lesson you'll find opportunities for extensive practice, self-review, and self-evaluation. There are 3 varieties of standard Finnish: "kirjakieli" or “book language” which is used in official documents, official speeches and the daily news; "yleiskieli" or “standard language” which is taught in schools - formal and correct, though more relaxed than the "book language"; and "puhekieli" or "spoken language" which is a frequently changing, more casual variety used in everyday conversation. This course teaches the standard Finnish language, "yleiskieli." Stuck in my brain for months! May I rate it 0 from 5? 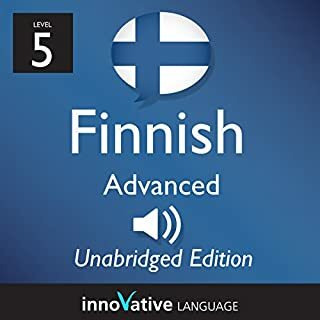 This audiobook will take you through the basics of Finnish with Basic Bootcamp, All About, and Pronunciation lessons. The five Basic Bootcamp lessons each center on a practical, real-life conversation. At the beginning of the lesson, we'll introduce the background of the conversation. After the conversation, you'll learn carefully selected vocabulary and key grammar concepts. Next, you'll hear the conversation one time at natural native speed. Finally, practice what you have learned with the review track. In the review track, a native speaker will say a word or phrase from the dialogue. Repeat the words and phrases you hear in the review track aloud to practice pronunciation and reinforce what you have learned. In the 15 All About lessons, you'll learn all about Finnish and Finland. Our native teachers and language experts will explain everything you need to know to get started in Finnish, including how to understand the writing system, grammar, pronunciation, cultural background, tradition, society, and more - all in a fun and educational format! The five Pronunciation lessons take you step-by-step through the most basic skill in any language: how to pronounce words and sentences like a native speaker. You'll go from basic concepts to advanced tips and will soon sound like you've been speaking Finnish your entire life. Teaches the style of Finnish that you are more likely to use in general conversation. The amateur narrator's voice interferes with learning the subject. The jokes or attempts at humor are annoying. 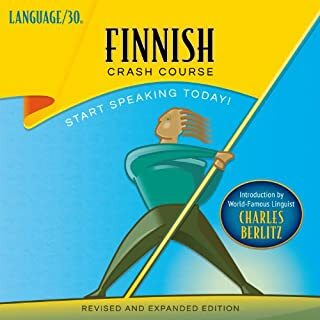 The "Top 25 Finnish Questions" audio book is much better, with professional voice talent.